The first Russian referee in the NHL is back to Russia and will spend the next season in the Kontinental Hockey League. In his first interview after his return, Evgeny Romasko talked about his English lessons through a cellular company, working for two leagues simultaneously, critics to NHL refs and much more. Four years ago, the news about Romasko moving to the NHL was a true sensation. The NHL was about to get its first Russian ref. Romasko’s adventure lasted for four seasons. In this period, he amassed 66 games in the NHL, more than 250 games in the AHL, new emotions, feelings from a different life and different hockey and, of course, the huge experience he gathered from all this time. - Evgeny, the first question is quite natural: why did you decide to get back? - I’ve got an offer and I happily accepted it after four seasons in North America. I think that it has been a great period in my life. I tested myself in a strong league and gathered invaluable experience. Now it’s time to apply my knowledge at home. - Were you offered to stay in America? - I cannot comment on certain points and reasons for my decision in the press. But if you ask about the conditions, then in our league they are about the same. This is definitely not a matter of money. - But I chose Russia. Of course, working in the NHL is the dream of each referee. But now, thinking about the past, I understand that I have nothing to regret about. Simply it’s time to get back home. Here it’s more comfortable, easier. And the KHL is one of the top leagues in the world. - Did your contract in North America run out? - Yes. You know, the KHL chief referee Alexei Anisimov offered me to get back last year, but I was under contract. - You had great accomplishments. There were no other Russian refs in the NHL or in the AHL, and you don’t meet European officials very often. 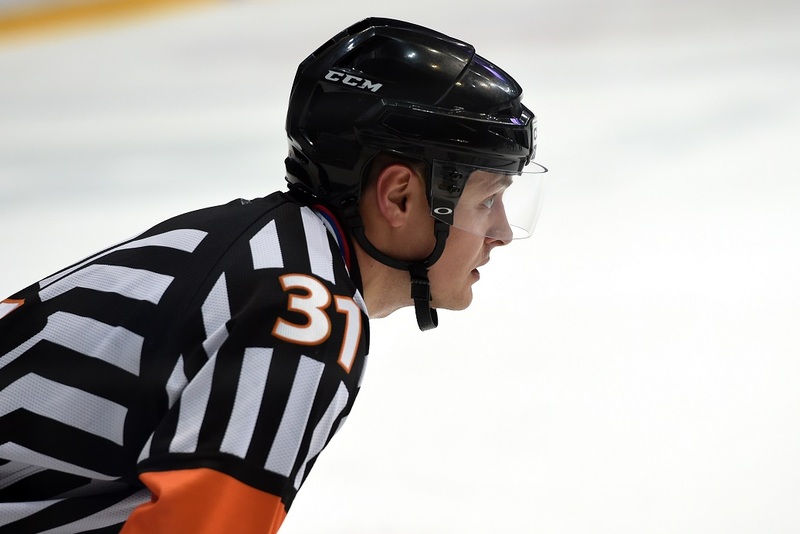 - The first was the Swedish ref Marcus Vinnerborg, but he’s back home now, and in the AHL there is one linesman from the Czech Republic. No one else. - Back in the days, your departure shocked many people. You were considered a very good referee, but you never worked at the IIHF World Championship. Did you understand why was it happening? - I simply did not manage to work at the IIHF WC because my international career just started. I’ve got my offer during the international training camp in Switzerland, at the Olympic Games preparation camp. The NHL Director of Officiating was present there. The rules have some significant differences. I read and reread the rules on the plane, but there is also a muscle memory, which is more difficult to cope with. - Did you accept right away? - Of course. But then, a not easy period started. I started working in the AHL without having signed an official contract, and moreover, I was still under contract with the KHL so from time to time I had to get back home and start officiating there too. I flew a lot in that period, but I always tried to be in an ideal shape. After this sort of try-out in the AHL, I was offered a contract by the NHL. - What did the Americans like in you? - As I have been told, there were three things. First, my experience in the KHL, having officiated almost 300 games. Second, my skating. Third, my rigidity in decision-making. I was followed for a long time and I was scouted at the U18 and U20 WJCs. - I’m sure that before the offer your English was far from being ideal. And a ref without a good command of the English language is like a ref without a whistle. How did you deal with this problem? - You are right, I needed to study English and I spent a lot of time on this activity. I attended courses, took lessons on Skype. But 90% of the result comes from communicating. But since I did not have any friend to talk with in English, I found a way that I’m sure you’ll find pretty strange. - I called a cellular company so that I could talk to an operator for some fifteen minutes for free. I had questions, got replies and tried to understand. I was trying to form phrases the correct way, without mistakes. - I can only imagine how many times you changed your plan. - Plans are just a nuance, there are a lot of factors which are very different from Russia. These talks helped me a lot. As a result, I worked very hard and my English became good. There was no other way. I needed to communicate my decisions to coaches, players, and be sure that they would understand. I didn’t have a translator. I started working in the AHL without having signed an official contract, and moreover, I was still under contract with the KHL so from time to time I had to get back home and start officiating there too. I flew a lot in that period, but I always tried to be in an ideal shape. - Never. All the communication with supervisors was, of course, in English. I truly had to start understanding everything right away. - Were you often scolded overseas? - Scolded? Of course, I had some problems, but that happens even to the best refs in the NHL. There are no problems with this in North America, no one looks at the experience or at the past honors. But, I want to highlight that everything is going on inside the Department of Officiating. The league closely checks that the teams or other participants in the game won’t comment on the officials’ decisions, do not give them a public assessment. For this, the league has strong penalties. - Yes, I know that now in the KHL the boards are trying to avoid public discussions about refereeing. I support this position taken by the League. Officials’ decisions are something that should be discussed between the Department of Officiating, and not by coaches, players, or the press. - It looks like you forgot some things about Russia, Evgeny. But I’m sure that you’ll be used to it again after a couple of games. Where did you live in North America? Was your family with you? - In the first season, when I worked on both AHL and NHL, my family wasn’t with me. I was flying all the time and there was little sense for them to be there. But on the next season, I brought my family with myself. I have been offered several variants to settle down and after careful considerations I chose Hershey. - It’s a little and quiet town. There is a good airport, from which you can go wherever you need. Plus, it has a great location, you can reach so many arenas by car. A 500-600 km trip is not a problem for me. - Did you get many tickets? - Not a single one. I am a careful driver. Generally speaking, it’s easy to drive in America, difficulties start only in winter. Of course, I had some problems, but that happens even to the best refs in the NHL. There are no problems with this in North America, no one looks at the experience or at the past honors. - What’s the problem, streets don’t get cleared? - No, but in America, as much as I tried, studded tires are forbidden. You can only drive with winter tires, without studs. And when there are snow blizzards, well, it’s hard. It can be surprising, but I was never late for a game. The key is just to prepare correctly. To check the itinerary, have a look at the weather forecasts and always start your trip early. It’s better to arrive five hours earlier, then one minute late. - How do refs live during away trips? - There is a unified hotels system. There is a partnership with the Department of Officiating and you can also gain points that you can spend later. Rooms are always the same, there are no differences, only that in a place a room costs $60 a night, and in another place – $700. - Did you work for Hershey games? - I often worked in the local games, in North America there isn’t such a concept that at the home arena, refs from the home city can’t work. Okay, I was a foreigner who was just living in that town, but it’s like that in any city. Why should you search elsewhere when you have a ref right in the town? - Were you recognized around? - You can’t even imagine how much this city loves hockey. People of all ages. Elderly people came at me, wished me good luck and we talked very kindly. It was like that wherever there are teams. - In the AHL the attendance is inferior to the NHL. - Sometimes the arenas are half-empty. But in the NHL, it’s never like that. I really liked the arenas in Montreal, Chicago, New York. In Chicago, for example, the crowd is very loud, it’s a pleasure to work in such an environment. - In the KHL and overseas, hockey has different rules. - This was definitely a problem. The rules have some significant differences. I read and reread the rules on the plane, but there is also a muscle memory, which is more difficult to cope with. But in the end, I got used to it. - What is the most significant difference? Judging hits? - No, with high-sticking. In North America, there are different criteria. - Many people saw your first game in the NHL between the Oilers and the Red Wings. Were you nervous before the game? - Sure. Everyone would be worried on my feet. I think that players have the same kind of emotions. I reread the rules for the whole night before the game. I was repeating them between me and me, just not to allow any mistake. I understand that I have nothing to regret about. Simply it’s time to get back home. Here it’s more comfortable, easier. And the KHL is one of the top leagues in the world. - Please explain us how you could miss Braydon Coburn hitting Evgeny Kuznetsov between his legs. - Did it really happen? - Yes, it was a game between the Lightning and the Capitals. - You know, there were so many games, I can’t remember that one. But sure, I’ll re-watch that episode later, just to understand what happened. - Did you change your preparation toward the season now that you’re back in Europe? - I changed my plan a little, but not too much. I always thought that a ref must get to the start of the season in ideal shape. This is what I try to do and there is no other way. Last year I had almost a hundred games in different leagues. You can’t live through such a load without proper preparation. - We didn’t lose Evgeny of sight in these years. Of course, we followed the first – and thus far only – Russian official in the NHL. The four seasons he worked abroad are an indicator of his high professional level. I am sure that these seasons will be very useful to him as he gathered a lot of valuable experience, which can now transmit to us. I express my deepest congratulations to Evgeny for his return, our officiating team is happy to welcome him back at home.